Starring: Ansel Elgort, Jon Hamm, Eiza González, Kevin Spacey, Jamie Foxx, and more. Lets be real here, a bulk of the viewers for this film are Edgar Wright/Cornetto Trilogy fans and a small percentage of ladies going googly eyed for Ansel. A smaller percentage are genuinely interested movie-goers who might have stumbled upon the trailer or heard of the film. 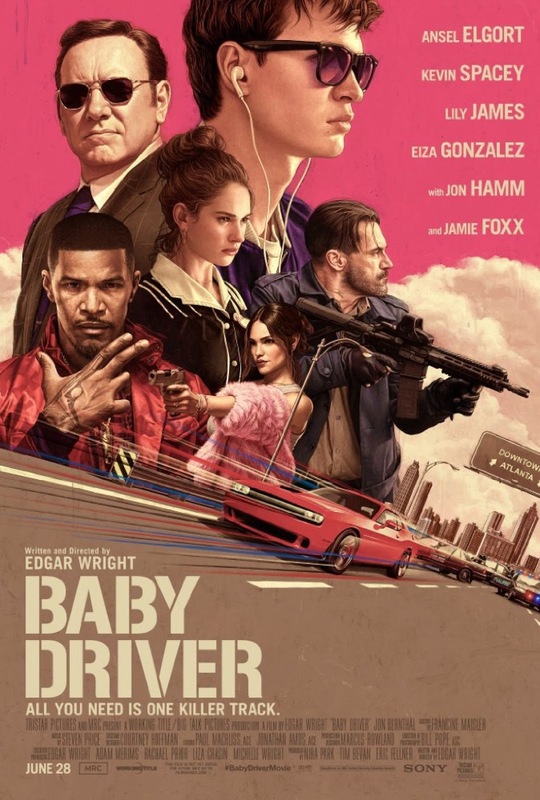 But regardless of which viewer is seeing this film, one thing is for certain; ‘Baby Driver’ is going to have that Edgar Wright flair. Action-packed comedy with a dope soundtrack, ‘Baby Driver’ is sure to have people’s hopes up high. Well let us give Baby an Oberrating. I was hyped for this movie since seeing trailers way early on. A star-studded cast, a strong and creative director, and all the correct components to make an entertaining action-comedy. I anticipated ‘Baby Driver’ to blow me away and in most ways, it did so. ‘Baby Driver’ is an adrenaline filled action bit surrounded by a soundtrack that simply grooves. Entertaining from start to finish, Edgar Wright has delivered yet another film that has the capability to satisfy film fans of all kinds. It is a fine blend of comedy, action, foul-mouthed dialogue, adrenaline infused car tricks, a dash of romance, and so much more. All put together into one witty and creative Wright branded film. Easily, taking the cake as my favorite part of the film was Ansel Elgort’s performance. I have been a fan of his for awhile now (and yes, the start of my appreciation was ‘The Fault in Our Stars’. Hate on it). I am happy to see him growing more into an excellent actor and this role is a fine example. From the start, he delivers a suave and charismatic Baby, yet also quiet and reserved. As the story progresses, his character becomes more likable by the moment as the “good kid trapped in a bad situation”. In all honesty, there is not much else I could say about the film. While being great fun for the duration of its run time, it only has moments where I felt that it was wandering aimlessly without much purpose other than to entertain; but even in those moments, it was not enough to leave me dissatisfied with what I was watching. Edgar Wright delivers us yet another trademark film of his. While being a bit like a parody of ‘Drive’, ‘Baby Driver’ is a high-octane entertainment package sure to satisfy film fans of all kinds. A fun film for the summer and surely to be a memorable bit for the year of 2017, ‘Baby Driver’ gets an Oberrated stamp of approval. **EDIT** Source of reference to my IMDB summary WAS here before I “infringed” on the content. Posted in 2017 Movies, Movie Review.Tagged Ansel Elgort, Baby Driver, Edgar Wright, Eiza Gonzalez, Jon Berthanl, Jon Hamm, Movie Reviews.